TASTE: Milk chocolate, toffee, and roasted malt in the front that give way to a slightly lactic, sour middle. Some bitterness in the finish, but whether that’s from hops or alcohol is unclear. MOUTHFEEL: The “Silk” in the title threw me off as this beer isn’t silky-smooth at all. It’s actually a touch thin-bodied and even a bit watery. Some decent carbonation makes up for it though. DRINKABILITY: The B.O.R.I.S. 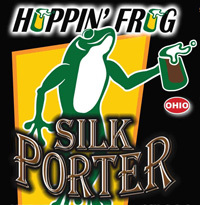 the Crusher was the first Hoppin’ Frog I sampled and I had high expectations for the Silk Porter. Alas, it didn’t live up to its sister brew’s lofty reputation. Still, it’s an easy-drinking brew…nothing for Hoppin’ Frog to be ashamed of. Posted in Tasting Notes.Tagged Atlanta, Hoppin' Frog, Porter, Silk Porter.